Transparency Market Research (TMR) has published a new report titled, ‘Therapeutic Plasma Exchange (TPE) Market - Global Industry Analysis, Size, Share, Growth, Trends, and Forecast, 2018–2026.’ According to the report, the global therapeutic plasma exchange (TPE) market was valued at US$ 1,063.38 Mn in 2017 and is projected to expand at a CAGR of 7.5% from 2018 to 2026. Increase in indications of plasma exchange in chronic diseases, cost advantage of plasma exchange over other therapies in certain disorders, and favorable reimbursement scenario are the factors likely to drive the global therapeutic plasma exchange market from 2018 to 2026. Clinical applications of therapeutic plasma exchange are increasing rapidly in terms of scope and number. Plasma exchange is recommended as the first line of therapy in several chronic as well as acute diseases. Therapeutic plasma exchange is considered a promising method in some potentially fatal intoxication. In phalloid mushroom intoxication, plasma exchange was as effective as haemoperfusion in reducing mortality from as high as 30% to 50% with conventional therapy to less than 20%. Plasma exchange is highly effective in the treatment of life threatening intoxications with 4-cyclic (maprotyline) and tricyclic (amitriptyline) antidepressants. It is helpful in removing drugs such as L-thyroxine, diltiazem, verapamil, and carbamazepine from plasma. It has also been used to remove protein-bound heavy metals in plasma and phosphoroorganic intoxications. The report offers detailed segmentation of the global therapeutic plasma exchange (TPE) market based on disease indication and end-user. In terms of disease indication, the neurological disorders segment is anticipated to account for the largest market share, as most of the indications in ASFA guidelines in category I and II are for neurological disorders. The hospitals segment is expected to account for the leading share of the market in 2026. The segment is likely to expand at a rapid pace during the forecast period. Therapeutic plasma exchange is an inpatient treatment that can only be carried out under expert supervision. Moreover, the patient needs to be treated for more than three days depending on the medical condition. This requires significant infrastructure and spending. These factors can be attributed to the growth of the segment during the forecast period. Europe held a significant share of the global therapeutic plasma exchange (TPE) market in terms of revenue in 2017. The developed health care infrastructure in the region has helped patients undergoing TPE in covering their expenditure. Most of the health care providers in countries such as Germany, the U.K, and France provide full or partial coverage of costs related to treatment, medication, physicians cost, and tests depending on the patient’s insurance plan and income. Moreover, Europe is home to several key players, such as B. Braun Melsungen AG and Fresenius Kabi, who lead the therapeutic plasma exchange market. North America is expected to account for the second largest market share in terms of revenue during the forecast period. High diagnosis and treatment rates of diseases such as chronic inflammatory demyelinating polyneuropathy, myasthenia gravis, and multiple sclerosis in the region are expected to drive the market. Moreover, high awareness about latest health care technologies and higher purchasing power are anticipated to propel the therapeutic plasma exchange market in North America. Favorable reimbursement policies in the region also enable patients to avail the best of health care facilities. 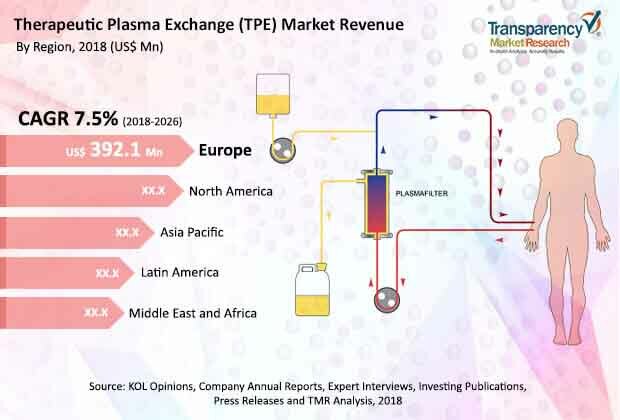 The therapeutic plasma exchange (TPE) market in Asia Pacific is expected to expand at a rapid pace, primarily due to improving health care infrastructure, rise in private and public investment in life science research, and technological advancements in countries such as China and India. The report also provides profiles of leading players operating in the global therapeutic plasma exchange (TPE) market. These include Baxter International, Inc., Terumo Corporation, Kawasumi Laboratories, Inc., Haemonetics Corporation, Cerus Corporation, Hemacare Corporation, and Medica S.p.A.